American consumers are about to experience a game-changer in terms of lighting their homes, as LED bulbs become the dominant light bulb technology within the next three years. Once thought to be a lighting technology only for early adopters willing to pay top dollar, LED bulbs are now a possibility for the average consumer, with prices hovering around $2 per bulb across the country, and as low as $1 or less in many areas. Using less energy, the bulbs pay for themselves in a matter of months, and can save households $50-$100 per year in utility costs. LED bulbs will see widespread adoption by 2020 in significant part because of utility programs across the country continuing to rebate the bulbs and educate consumers about the energy efficient options that are available. Despite the tremendous savings opportunity, many Americans have yet to experience the LED difference in their own homes. Less than 30% of U.S. light bulb sales in 2016 were LED, and according to a report by ORC International, most consumers have little knowledge about the various light bulb options available to them. With the average American home containing approximately 50 light sockets, and about 60% of them still containing an inefficient bulb, the opportunities for energy savings are huge. Energy saving alternatives to the familiar incandescent bulb have been around since the 1980s, but none of them have brought on a massive evolution in the lighting market. Compact florescent bulbs (CFLs) proved the most successful, but early performance concerns made widespread adoption a hard sell for many consumers. LED bulbs have faced their own challenges, in particular suffering from limitations affecting brightness and light distribution. But bulbs that have earned the government-backed ENERGY STAR label are independently certified, undergoing extensive testing to ensure that they perform as promised, saving energy, delivering on brightness, and working the way consumers expert. Bulbs that have earned the ENERGY STAR use 70-90% less energy than incandescent bulbs, and last at least 15 times longer. The ENERGY STAR program is betting that as more and more consumers learn about the benefits of this technology, they will see the light and join the LED revolution. 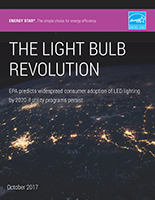 EPA’s 2017 report, “The Light Bulb Revolution” details a short history of light bulb technology, options for consumers today, major market shifts, and data showing we are just scratching the surface with this promising new technology.